Earlier this year Crunchyroll launched its first Fathom Event with a theatrical release for the premiere of Mob Psycho 100 season 2. It was the first event that spearheaded what would be a year-long partnership between Crunchyroll and Fathom. This resulted in an assortment of anime titles premiering on the big screen. Today, Crunchyroll has announced its next Movie Night with Fathom events with the U.S. theatrical premiere of Saga of Tanya the Evil – The Movie. The event will take place on May 16th and will premiere in more than 500 theatres across the country. The movie will show at 7:30 pm local time. Fans who attend the Crunchyroll Movie Night will also see an exclusive interview with the director of the film, Yukata Uemura. This will also give fans a behind-the-scenes look at the drama and inspiration for this new story arc. Earlier this year, the film was released in Japan which received critical acclaim. It is a direct sequel to the series, which was inspired by the light novel of the same name. 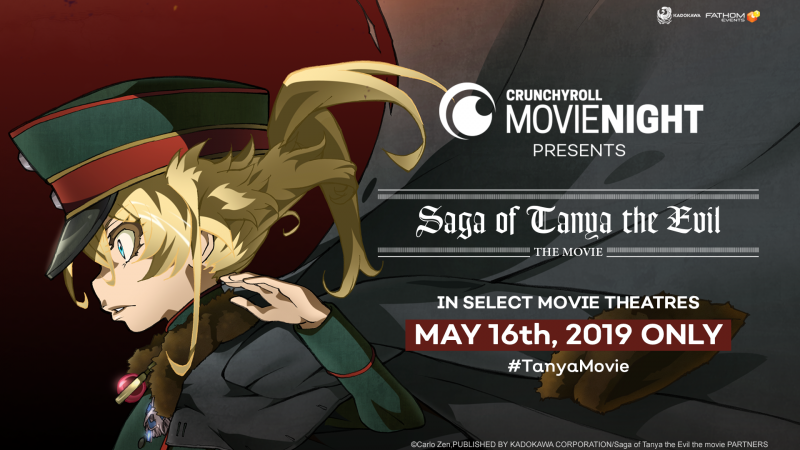 The post Crunchyroll Movie Night brings Saga of Tanya the Evil to the big screen appeared first on Nerd Reactor.